If you want to really get away, yet still have a comfy roof over your head, fly to Mackay Bar. 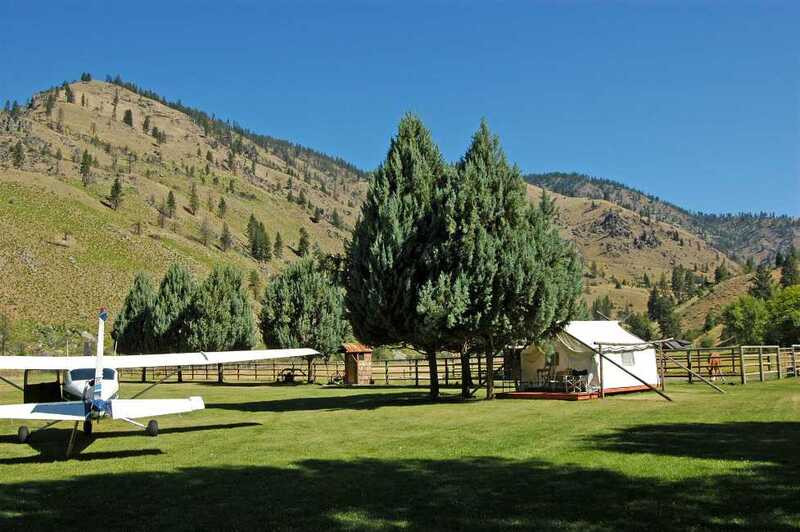 Mackay Bar airstrip, in central Idaho along the south bank of the main Salmon River, is an incredible backcountry getaway for pilots. Others simply lack the space in the aircraft for a tent, at least not if they want to bring the family, or maybe they’d just rather sleep in a real bed and not have to cook. If you want to really get away, yet still have a comfy roof over your head, fly to the Mackay Bar Airstrip. But you’ll get way more than just a cozy cabin. 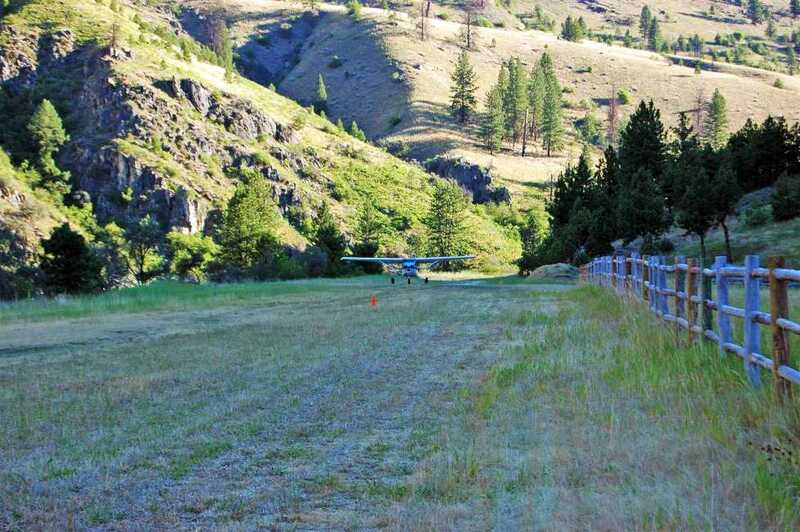 The strip’s lower elevation, just over 2,000 feet, means it’s snow-free much sooner than many other mountain airstrips, so you may be able to access it for the late winter and late fall steelhead fishing seasons. 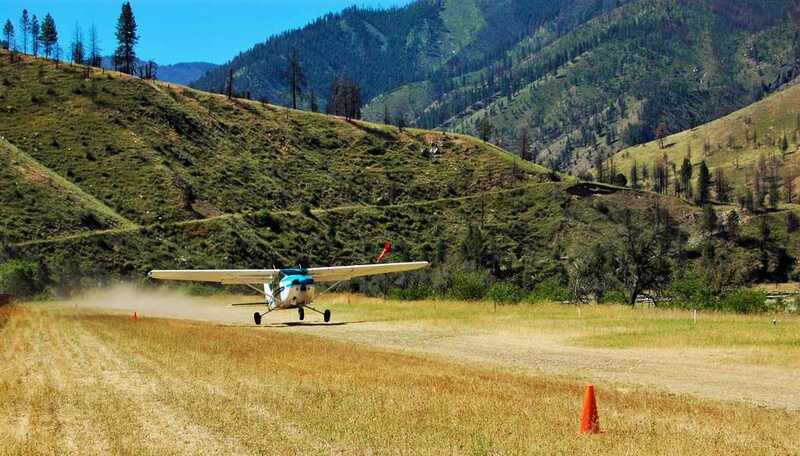 The airstrip is in excellent condition, yet its location beside the Salmon River inside a deep, twisting canyon makes it challenging enough to deliver a real sense of accomplishment after your arrival. When you step out, you’ll be surrounded by the Frank Church River of No Return Wilderness, which, at 2.3 million acres, is the second-largest wilderness area in the lower 48 and home to magnificent wildlife. 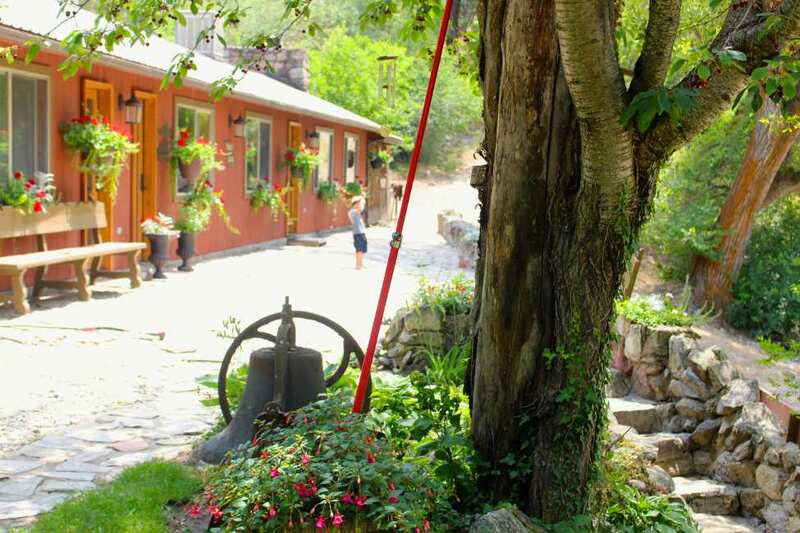 Above the riverbank, you’ll find a family-owned-and-run guest ranch with a cozy lodge and private cabins. 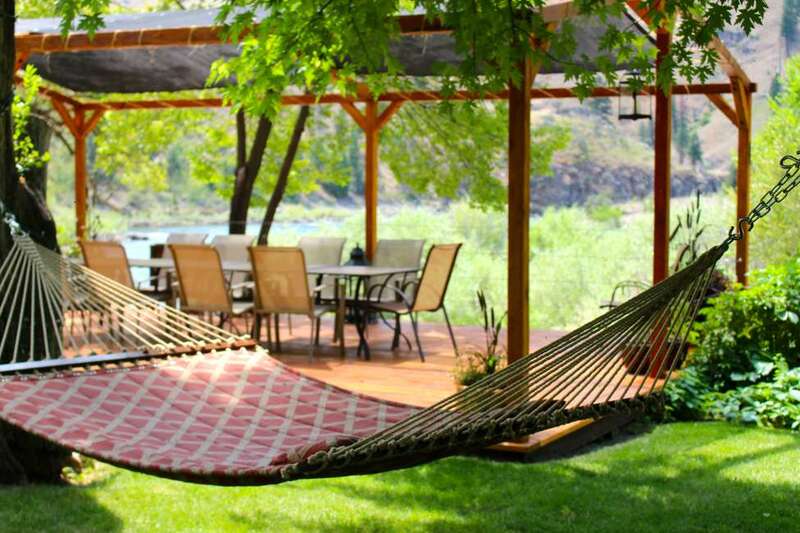 You’ll also find a hammock stretched above a lush green lawn, fragrant roses, access to outstanding fishing and hunting in season, and even a jet boat! Hike, or just relax and enjoy good meals or have fun with your kids. Before you fly to Mackay Bar, be aware that it is a privately-owned airstrip and you need permission to land there and a reservation to stay there. Mackay Bar airstrip lies in central Idaho, along the south bank of the main Salmon River, just a few hundred yards upstream from its confluence with the South Fork of the Salmon River. Local pilots who know these canyons and rivers well often fly down inside the canyons to their destinations. But if you don’t know exactly where you are, there’s a chance you could end up in a box canyon or make a wrong turn and get lost. Therefore accurate navigation is crucial, especially if you’re flying upstream. Unless you’re intimately familiar with the area, it’s safer to input your destination into your GPS and fly relatively direct, over most of the terrain, which you can do at about 9,500 feet MSL here, assuming good VFR weather, and then descend into the canyon once you have your destination in sight. Monitor 122.9 MHz and use it when you broadcast a position report. As you approach Mackay Bar, look down at the river and memorize the terrain so it will be familiar when you are flying inside the canyon. You should see the river confluence just downstream from the airstrip, as well as a bridge just upstream. Another airstrip, Wilson Bar, is 1.4 nm upstream from Mackay Bar, and the canyon widens at Five Mile Bar (also called Buckskin Bills) another 1.2 nm above that. You can see all of this on Google Earth before your flight. Many pilots don’t know the actual runway numbers are 18/36 because they’re usually not published. As you announce your intentions on the radio, you can just say “landing upstream” or “landing downstream.” Most approaches to Mackay Bar are made downstream (Runway 18). To set up your approach, fly upstream past Mackay Bar, the bridge, and then Wilson Bar to Five Mile Bar, then turn around where there is sufficient room in the canyon. This will set you up for about a 2.6-nm approach to lose altitude before landing. You should be in landing configuration at final approach speed by the time you pass Wilson Bar airstrip on the right. The river then makes a left turn. Ahead, you will see the tall mountain slope behind the river and the bridge. Look past the bridge and see that the river makes a turn toward the right, followed by an immediate sharp, 90-degree left turn. The Mackay Bar airstrip is not yet visible, but it’s on the left bank just where the river makes its sharp left turn. As you pass the bridge (no more than 200 feet above the river at this point), hug the right side of the canyon (this is your base turn) to give yourself as much time and room as possible to line up with the strip, which comes into view suddenly on the left. If you’re too high and/or fast when you see the strip, apply power, follow the river, and climb out. Relax! Remember, you’re flying downstream, so the river is descending. Just be patient, climb out, go back and turn around at Five Mile Bar, and try again. You’ll briefly see Wilson Bar below the pilot at 1:18. If you’ve never flown in to Mackay Bar, watching the video several times will really help. Turn left at the end of Runway 18 and park along either side of the large clearing. There are no tiedowns or fuel. The nearest fuel and services are at McCall (MYL), 39 nm southwest. Departures can be made either way, although most prefer to depart on Runway 36. The departure is complicated by the trees at the end, followed by the abrupt 90-degree right turn the river makes, followed by the fact that the river and terrain are rising, so you must think well ahead of the airplane. The Runway 18 departure requires an immediate right turn upon liftoff to follow the river downstream. Generally speaking, particularly in summer, it’s advisable to do your mountain and canyon flying in the early morning or late evening. Long days mean that even by 10 or 11 a.m., the sun has had plenty of time to warm the air, creating thermals and funneling air through canyon openings. Furthermore, many backcountry airstrips are one-way-in/one-way-out or have no go-around. It helps to have calm air, rather than potential tailwinds. Mackay Bar, at 2,172 feet, has a lower elevation than many Idaho airstrips, but that just means it will be warmer. If you’re not familiar with mountain and canyon flying, consider brushing up on your skills and even landing your plane at Mackay Bar the first time with a specialized instructor who is also familiar with the area. In McCall, Lori MacNichol operates McCall Mountain/Canyon Flying Seminars with both group lessons and private instruction, 208-634-1344, www.MountainCanyonFlying.com. In Challis, Pete Nelson at Middle Fork Aviation also offers backcountry flight instruction, 208-879-5728, www.MiddleForkAir.com. Additionally, every Idaho backcountry pilot wants a copy of Galen Hanselman’s “Fly Idaho!” in the cockpit. The completely new Third Edition of this “bible of the backcountry” will be available mid to late June, a culmination of five years of work, and over 900 pages. You can currently pre-order a hard-bound copy of the book for $59.95, or a digital eBook version for $39.95. Pre-orders will not be charged until the book ships, and will receive a special Idaho backcountry add-on for ForeFlight, with identifiers for 17 airstrips not on FAA charts, a $19.95 value. For more information, and to pre-order, visit www.FlyIdaho.com. Hanselman also created a special Idaho VFR Chart which shows the entire state and nearly all of Idaho’s backcountry airstrips, available for $10 at www.IdahoAviation.com/store.php. Given the vast tracts of wilderness that now make up much of central Idaho’s mountainous areas, modern-day visitors are often surprised to learn the area was once full of mines, constructed in the decades after the Gold Rush. The hills and canyons were home to a relatively large population of miners, and locally-raised cattle were sold to feed them. William B. Mackay arrived with his wife about 1900 and built a log home above the river. Mackay did some placer mining and kept a herd of cattle. When he died in 1916 he was buried on the hill—a marker is currently being installed at his gravesite—and his estate took official title to the land in 1923. The Mackay Bar Bridge was built in 1935 for pack stock. Subsequently, several hundred tons of equipment were flown from McCall to Mackay Bar in two-ton loads for mining the area prior to World War II. The gravel scree slope on the Salmon’s south side, just before the confluence, is evidence of S. R. Placer Company’s short-lived plans. Al and Mary Tice next bought the land, turning it into a sportsman’s resort; they subdivided part of the pasture and sold lots, which is why you will see a few private cabins along the pasture at the bottom of the mountain south of the airstrip. In 1969, Robert Hansberger bought the 61 acres from the Tices, maintaining the ranch for sportsmen and vacationers until selling it to his caretakers, Ken and Andrea Cameron. In 2010, Don and Andrea Betzold purchased the property, then sold it to current owners, Buck and Joni Dewey in January 2013. It’s truly off the grid—the ranch has its own hydroelectric generator. In July 2007, the fearsome Rains Fire bore down upon the ranch to within a few feet of the buildings, but through valiant efforts the ranch and cabins were saved. How does this Shangri-la exist within a Federal Wilderness, you ask? 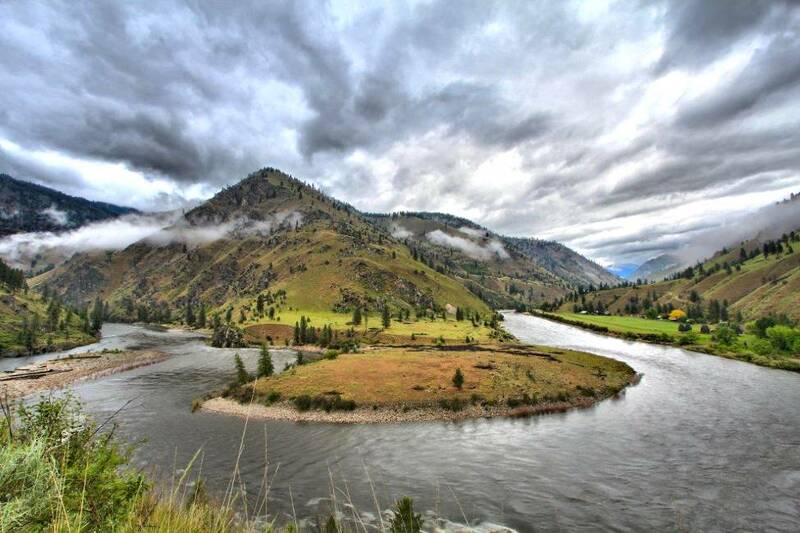 When the Frank Church River of No Return Wilderness was created in 1980, private inholdings were allowed to remain, and jet boats were permitted on the main Salmon River. Existing airstrips were also grandfathered in, but some of them were later closed by the Forest Service, including nearby Wilson Bar. The Idaho Aviation Association has fought for and won the re-opening of these strips for all pilots. Wilson Bar was re-opened in 1995. Joining the IAA helps keep them open, and their newsletter (which—full disclosure—I am the Editor of) will keep you informed of the latest issues and events, like fun fly-ins and work parties where you can make new flying friends, www.IdahoAviation.com. Mackay Bar Outfitters and Guest Ranch is a family-run operation with owners Buck and Joni Dewey, and their young son, Dax, pitching in. Its relatively low elevation allows it to remain open all year except from about December to mid-February. Reservations are required. The dinner, lodging, and breakfast package costs $170 per person per day with a six person minimum. To add on full facility use and ranch activities, such as horseback riding, jet boat tours, or fishing, the all-inclusive package costs $350 per person with a four person minimum. Joni is happy to work with guests to combine groups to accommodate singles or couples. 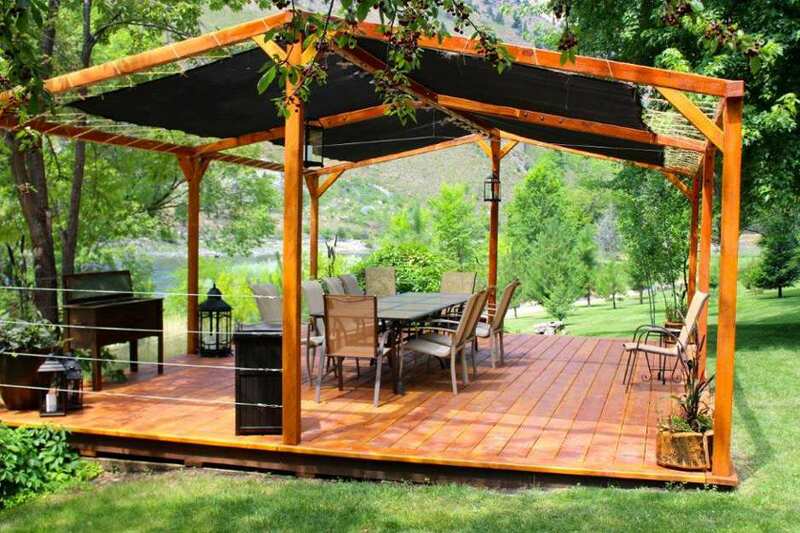 Email works best; reach Joni at Info@MackayBarRanch.com, 208-965-8355. In front of our tiedown on a sunny July day, the parking area and lawns in front of the main lodge were a deep, lush green, with volleyball and badminton nets strung out invitingly over them. A hammock hung in the dappled light between a pair of old trees. Fragrant roses lined the lawn, and a table and chairs perched above the river—a perfect spot for lunch under the shade of a huge tree, upon whose branches hundreds of cherries dangled just out of reach. A handy ladder nearby was put to good use, our hats filled with cherries, and it was time to relax and watch the river go by. A pair of binoculars allowed us to spy two bighorn sheep across the river: a pair of ewes picking their way across the gravel on some errand, surely aware of us, but not afraid. It’s normally difficult to spot these elusive and wary animals, but not here, where they come right down to the river from the rocky outcroppings above. Buttercups and berries lined the hiking trail to Wilson Bar, the airstrip on the opposite side of the river 1.6 miles upstream from Mackay Bar. 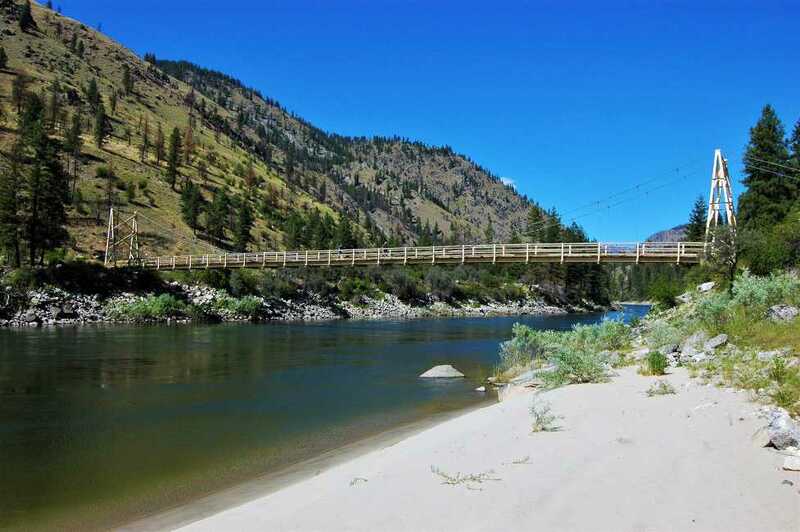 The trail follows the south riverbank, and you’ll soon see a lovely beach of the finest white sand, where the water is calm, making a perfect spot for sunbathing and swimming. After crossing the bridge to the north bank, you pass some burned trees and come to end of the airstrip. Nearby rapids churn the Salmon to a roar, providing ambience for Wilson Bar campers [see the Fall 2003 issue]. There’s a lot more easy hiking up the South Fork, or into the mountains on either side of the main river. You can also explore the area on a two- to three-hour guided horseback ride up the South Fork. Horseback riding trips are included in Mackay’s all-inclusive package. If you’d like a lot more excitement, arrange for a jet boat ride. The power and speed are exhilarating—it’s flat-out fun flying over rapids—and the scenery is breathtaking, with pine-studded craggy rocks rising steeply high above. You decide how long and far you’d like to go. Bring a picnic, go swimming or hiking, or visit historical spots. The cost of boat rides is included in the all-inclusive package or add them on to the other package for $175 per person (five-person min) for a daylong jet boat tour. The Salmon River has outstanding steelhead fishing in the spring (the A-run) and fall (the B-run). A-run steelhead average six lbs., but fall B-run steelhead average of 12 lbs., 16-pounders are not unusual, and you can have your fish prepared with dinner if you’d like. Walk to the fishing holes on your own or try guided steelhead fishing including lodging, meals, gear, and jet boat service for $375 per person per day (four-person minimum). More info on steelhead is available from Idaho Fish & Game. There’s also good smallmouth bass fishing on the main Salmon. The South Fork of the Salmon River has cutthroat, Dolly Varden, and rainbow trout catch-and-release fly fishing. Walk over on your own or go with a guide. For a real adventure, try a six-day, five-night fishing pack trip up the mountains behind Mackay Bar to the Chamberlain Basin where you’ll visit mountain lakes with almost no fishing pressure, $2,000, (five-person minimum). Mackay Bar offers guided elk hunting as well; they’re licensed, bonded, insured, and have operated in the same area for 30 years with a perfect safety record. They hunt in 117,612 acres of roadless wilderness habitat. You’ll ride their gentle, sure-footed stock with the pace of daily travel being set by you, but you should be in good shape as the terrain varies from meadows and woodland to steep, rugged canyons. Everything is provided except your personal gear. There’s a large kitchen and dining tent, with warm guest tents, shower, and lounging area with fire pit. A full-time cook prepares hearty meals. Elk season is generally mid-Sep–mid-Nov 18; deer and bear seasons are also open. If you buy tags for these animals in addition to your elk tag, there is no additional charge. Trips are eight days/seven nights; $5,000–$6,000. Lodge hunting is also available; contact Buck for options and pricing. Information on Idaho hunting and fishing is at www.FishAndGame.Idaho.gov. Mackay Bar has a variety of accommodations, all for the same price of $170 per person, which includes dinner, breakfast, and use of the facilities; children under 12 cost $50 less. The lodge consists of a large dining room with a professional kitchen walled off behind it. On one side of the dining room you’ll find a cozy living room area complete with river-rock fireplace, sofas, and rocking chair. Look through ranch photo albums, catch up on your reading, or play board games at the adjacent table. There’s a small store on the other side of the dining room stocked with t-shirts, caps, and a selection of books for sale with emphasis on the local area. There are no Wi-Fi or cell phone services here. Satellite phones are used in emergencies. Three cabins are perched on a small hill above the grounds. 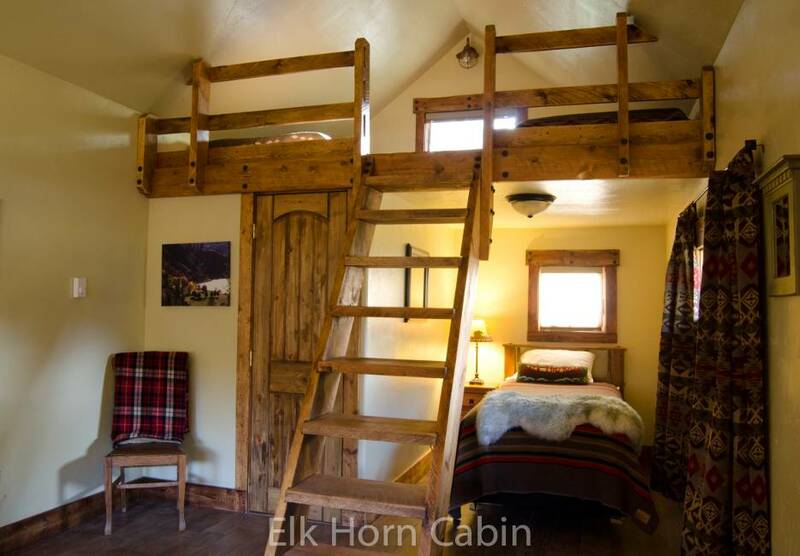 Each has a queen bed in one room, pair of twin beds in the other, and loft with another twin bed above. The bathroom, shower, heat, and air conditioning keep things comfy. Beside the lodge, the large Cougar Den has four rooms perched above the lawn. Each room has a pair of twin beds, a bathroom, shower, heat, and air conditioning. 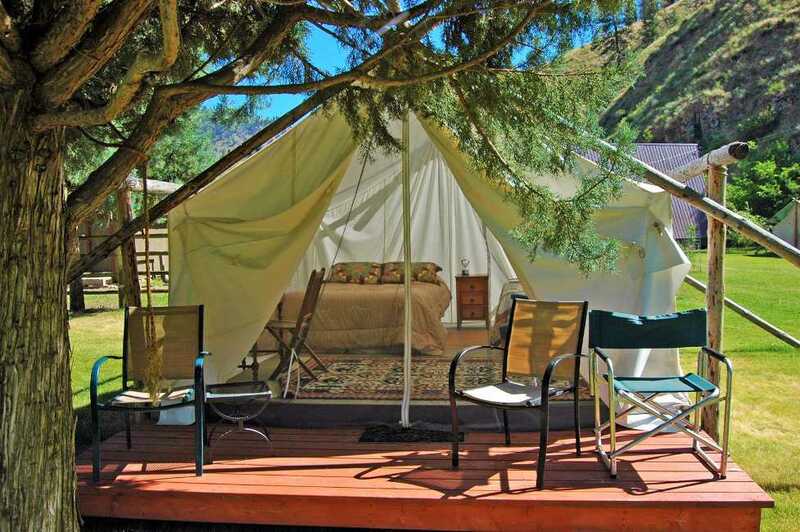 Down on the grass adjacent to the parking area and fenced pasture and shaded by a pair of pines is a beautiful wall tent reminiscent of an African safari tent, with a queen and twin bed, writing desk, and chairs on its front porch. Lodging normally includes dinner and breakfast, but pilots sometimes need to depart very early in the morning, so you may opt for lunch on your arrival day instead. Talk it over with Joni when you make your reservations; every effort will be made to accommodate your needs, including menu preferences or dietary restrictions. We enjoyed a heavenly lunch outside by the cherry tree. I was served the tastiest sandwich I have ever eaten: a perfectly grilled, smoked-turkey and Swiss cheese on sprouted wheat bread with avocado, tomato, lettuce, grilled onions, and homemade pesto, accompanied by roasted potatoes, lemonade, and little lumpy gems of just-baked chocolate-chip cookies. Evening appetizers are usually served from trays and enjoyed in the living room while the table is set. Dinner is normally served family-style, and the long dining table is perfect for getting to know other guests, although you may sit apart if you choose. There’s even a high chair so kiddies can comfortably enjoy meals at the table. We shared our dinner with a friendly group of 10 rafters, one of whom was celebrating his birthday. There was also a man who turned out to be a controller with Cleveland Center spending some quality time with his teenage son. We enjoyed Cornish game hen with plenty for seconds, along with sweet carrots, wild rice, and wines, followed by cake and ice cream. Breakfast served in the lodge includes coffee and juices, fruit, yogurt, pancakes, eggs, potatoes, and meats. As we were departing early, a lovely bowl of fruit was waiting for us at a separate table. 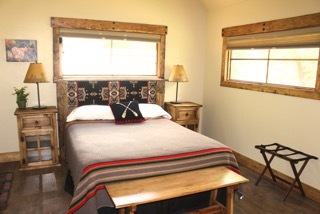 For reservations or information, contact the lodge at Info@MackayBarRanch.com, 208-965-8355, www.MackayBarRanch.com. Come to Mackay Bar for a home-away-from-home on the Salmon River. You can be out in the wilderness yet sleep in a comfortable bed and not worry about cooking. 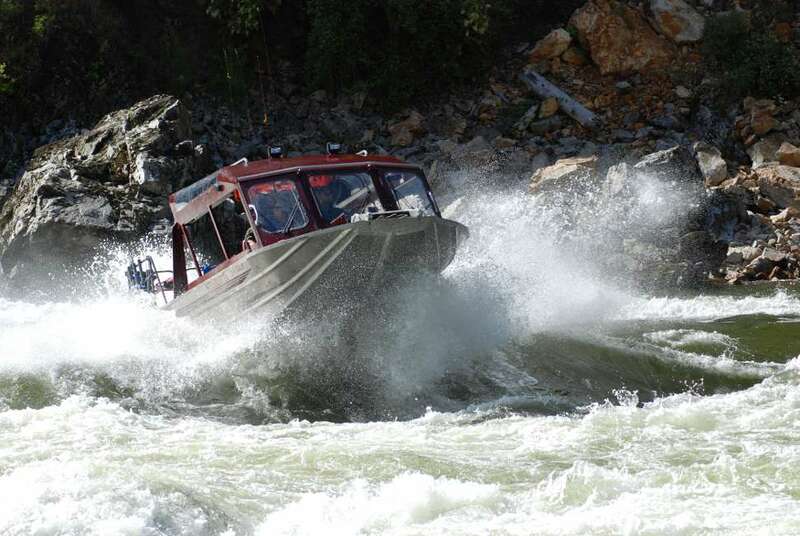 Try an exciting jet boat ride or savor a sportsman’s paradise for fishing and hunting. Or find happiness on a pristine riverside beach, watching the water glide by and savoring your good fortune at being able to fly into such a place in a private plane. So many wonderful aviation articles online these days but I always find Crista’s details, depth, & style to be the best! I enjoy the backcountry articles the most & I yearn to return to the FCRNR Wilderness!! !